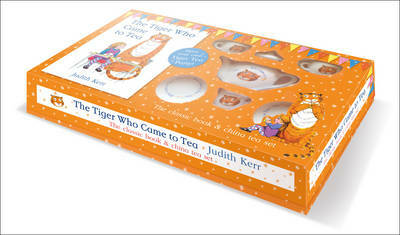 This special gift of a hardback book comes with its very own china tea set for you to hold your own tiger tea party. 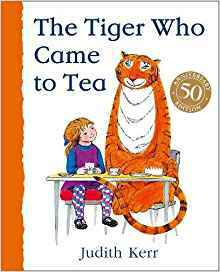 This wonderful story of a tiger coming to tea is about believing in the unexpected and magical. When a tiger turns up on the doorstep one day, the little girl and her mother just welcome him right in and offer him tea. He sits neatly at the table and eats his way quietly through every scrap of food in the house and every drop of drink, too. Then, just as politely, he takes his leave. When Dad comes home, there’s nothing left for him so he takes the whole family out for supper. 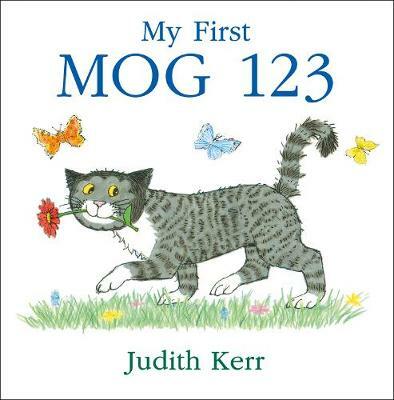 August 2013 Guest Editor, Lauren St John "I fell in love with the smiley, chubby tiger in Judith Kerr’s classic picturebook during one hot Zimbabwe summer when I had to read it four or five times a day to my niece. If it had been up to her I’d have read it even more frequently. Each time I got to the end, she pleaded for us to begin again. This is another wish fulfillment story, only for toddlers. A tiger turns up at the door and is invited in for tea by Sophie’s mum. It proceeds to eat its way through everything in the kitchen and pantry before departing with the same enigmatic smile. Sophie’s father turns up, graciously accepts that a fully-grown tiger has eaten his dinner and takes Sophie and her mum out for a meal. Pure genius." STOP PRESS - Win family tickets to see The Tiger Who Came To Tea - 3 lucky readers have the chance to win family tickets to see The Tiger Who Came to Tea on stage at the Lyric Theatre, London worth £80! - The tea-guzzling Tiger pounces back into the West End in this truly magical Olivier Award nominated production of THE TIGER WHO CAME TO TEA, opening at the Lyric, Theatre Shaftesbury Avenue on WEDNESDAY 25 NOVEMBER 2015 and running throughout Christmas to SUNDAY 10 JANUARY 2016. Click here to enter. The doorbell rings just as Sophie and her mummy are sitting down to tea. Who could it possibly be? What they certainly don't expect to see at the door is a big, furry, stripy tiger! 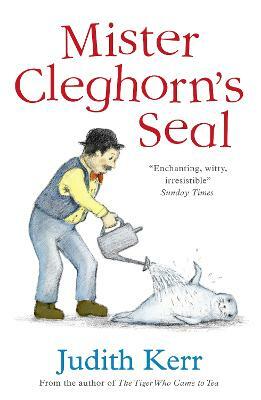 This captivating picture book has delighted generations of children for more than forty-five years. Now little ones can recreate the tiger's visit with their very own tiger tea set. This beautiful gift set contains: 1 hardback edition of 'The Tiger Who Came to Tea', 1 china teapot, 2 china cups, 2 china saucers and 1 china milk jug - perfect for hosting your own tiger tea party! exactly right, the resolution totally satisfying.’ Dorothy Butler, Babies Need Books. ‘A modern classic.’ The Independent.